Norsepower’s Rotor Sail technology confirms fuel-saving potential in two independent trials by NAPA and VTT Technical Research Centre of Finland. The sea trials onboard M/V Estraden, verified by NAPA and supported by VTT Technical Research Centre of Finland, confirm fuel savings of 2.6% using a single small Rotor Sail on the vessel’s route in the North Sea. Based on the trials, Norsepower and Bore believe that a full system on M/V Estraden with two rotors has the potential to deliver 5% efficiency savings on an ongoing basis. Norsepower forecasts savings of 20% for vessels with multiple, large rotors traveling in favourable wind routes. 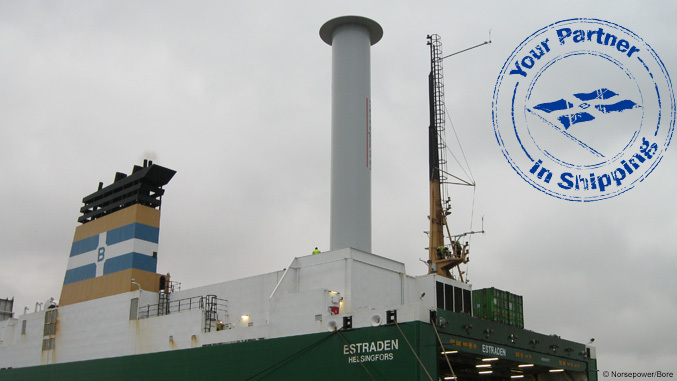 The Rotor Sail Solution was installed on the 9,700 DWT Ro-Ro carrier M/V Estraden in the end of 2014, and the vessel has operated in a continuous service between the Netherlands and the UK, sailing through the North Sea at speeds of 16 knots. The trials were measured and analysed with continuous monitoring systems from maritime data analysis, software and services provider, NAPA and VTT Technical Research Centre of Finland. VTT Technical Research Centre of Finland collected data over a six-month period, during which both the Rotor Sail technology and automation system was operational 99% of the time. The results confirmed that the Rotor Sail is able to produce large amounts of thrust force, which enables considerable fuel savings. Reinforcing VTT’s findings, NAPA conducted a randomised trial that found clear and significant savings, despite largely calm weather conditions throughout the study. After establishing a baseline profile of the vessel in normal operation, the Rotor Sail was activated and de-activated at random intervals to verify that any measured effect was solely due to the sail, and that any benefit was measurable across the vessel’s operating profile. The trial was conducted using ClassNK-NAPA GREEN, the vessel performance monitoring and verification software developed by NAPA and ClassNK.